Hybrid nanostructures including modified fullerene C60 and fluorophoric (E)-2-Cyano-3-(9-ethyl- 9Н-carbazole-3-yl)-acrylic acid (cyanoacrylic acid I) were created. Spectral properties (absorption and luminescence spectra) of the hybrid nanostructures were investigated. It was established what molecules C60 strongly affected spectral properties of cyanoacrylic acid I in the hybrid nanostructures. Luminescence quenching of fluorophore and a change of luminescence features were observed in the hybrid nanostructures. An investigation of influence of nanoobjects onto properties of optically active molecules is the one of the interesting fundamental problems of modern science. This phenomenon is strongly depended on a distance “molecule-nanoobjects” and exhibited in changing lifetime of excited states of atoms or molecules arranged at distances less than the wavelength of the irradiation  . Strong local fields affect the rate of electronic transitions, i.e. on the lifetime of excited states. They can affect light absorption and radiation parameters, energy (photo or electrical) transfer, as well as much enhance various nonlinear optical effects  . If optically active molecules are linked to a surface of nanoobjects by chemical bonds, it would be mean a formation of hybrid nanostructures  . In a general case, a hybrid nanostructure is a cross-linked system including nanoparticles of different natures (metal colloid nanoparticles, semiconductor quantum dots, oxide or polymer nanoparticles, carbon nanotubes, fullerenes, etc.) and functional molecules (photochromic, photoluminescent, electroluminescent, magnetically active, etc.). Carbon nanomaterials (carbon nanotubes, graphene, fullerenes) have unique electronic and mechanical properties and are widely applied for a creation of novel composite materials  - , electronic functional components   , etc. Fullerenes having very interesting properties due to unique electronic structure can be widely used for application in a construction of the hybrid nanostructures. Focus of this investigation is on an influence of fullerene C60 onto luminescence of fluorophore compound linked to fullerene surface. Carbazole derivative, (E)-2-Cyano-3-(9-ethyl-9Н-carbazole-3-yl)-acrylic acid (cyanoacrylic acid I), was used as fluorophore compound. The choose of the compound is caused of presence in the molecule structure two binding centers capable to link to nanoobject surfaces—1) carboxylic group and 2) aromatic π-conjugated electron system of carbazole cycle. A synthesis of the compound was made by a modified method  (Figure 1). Characterization and confirmation of the structure were made by NMR1H and element analysis. A water solution of cyanoacrylic acid I (c = 0.2 mg/ml) and NaOH in relation of cyanoacrylic acid I:NaOH = 1:1.5 (mol) was used. Fullerene С60 was purchased from NeoTechProduct Research & Production Company, Ltd. (Russia)  . Fullerene is needed in a surface functionalization for an application to create hybrid nanostructures. The functionalization leads to involve structure substitutions for bounding fullerene and cyanoacrylic acid I. Method  was used for the functionalization of C60. Method is based on functionaling of C60 by N,N’-Bis-(3-diethylamino-propyl)malonamide (Figure 2). Reaction was made in dried toluene in presence of CBr4 and under 4-fold excess of malonate. Mixture of mono-, diand tri-[N,N’-Bis-(3-diethylamino-propyl)-malonamide-2,2-yl]fullerene was obtained. Solid was dissolved in HCl (15%) and result solution was filtered, evaporated until 10 ml of solvent. A water solution of functionalized C60 (c = 0.02 mg/ml) was used for creation of hybrid nanostructures. Figure 1. Structure formula of cyanoacrylic acid I. Figure 2. Schematic reaction of a functionalization of fullerene C60. self-assembling process. It is an interaction of positive-charged ammonium substitutions of fullerene and negative-charged carboxylic groups of cyanoacrylic acid I. Such interaction is strongly depended on pH. A manage of pH is very important to synthesize of the hybrid nanostructures. In these work spectral characteristics (absorption and luminescence) of created hybrid nanostructures was investigated under different pH conditions. Absorption spectra were given by a spectrophotometer Lambda 35 (Perkin Elmer). Parameters of coverage were: optical length 2 mm; optical scan diapason 250 - 700 nm; scan speed 480 nm/min; slit width 2 nm; data interval 1 nm. Luminescence spectra were given by a spectrofluorometer Shimadzu RF-5301 PC. Parameters of coverage were: excitation wavelength 380 nm, excitation slit width 5 nm; emission slit width 5 nm; emission scan diapason 400 - 700 nm; sampling interval 1 nm. In first time spectral characteristics of solution of separated components (modified C60 and cyanoacrylic acid I) were investigated. It was shown that absorption and luminescence spectra of cyanoacrylic acid I were strongly changed in dependence on pH (Figure 3 and Figure 4). The spectral characteristics of modified C60 didn’t depend on pH. It was shown that magnitude of absorption on 289 nm was decreased, a pike on 316 nm was split in two with low intensity and a pike on 376 nm was shifted on 396 nm and significantly broadened (Figure 3). 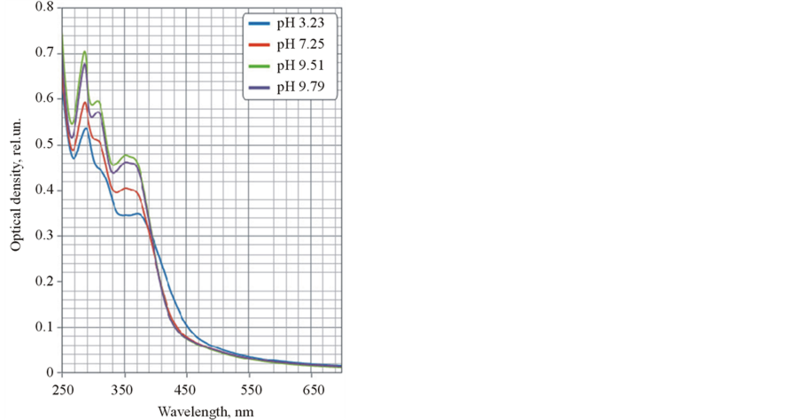 Also substantial shift of luminescence band maximum was appeared from 500 nm (pH 9.76) to 542 nm (pH 3.23) (Figure 4). It is probably explained that a protonated state of fluorophore molecule is formed. It is led to a redistribution of electronic density, absorption ability and changing magnitude of Stokes shift. Herewith luminescence intensity was risen more than 1.5 fold. Other behavior was observed for the hybrid nanostructures including modified fullerene C60 and cyanoacrylic acid I (see Figure 5 and Figure 6). A shift of maximum luminescence band was not appeared and luminescence was quenched. С17Н13N2-COOH + H2O ⇄ С17Н13N2-COO− + H3O+. Figure 3. Absorption spectra of separated components of the hybrid nanostructures. Figure 4. Luminescence spectra of cyanoacrylic acid I at different pH. Figure 5. 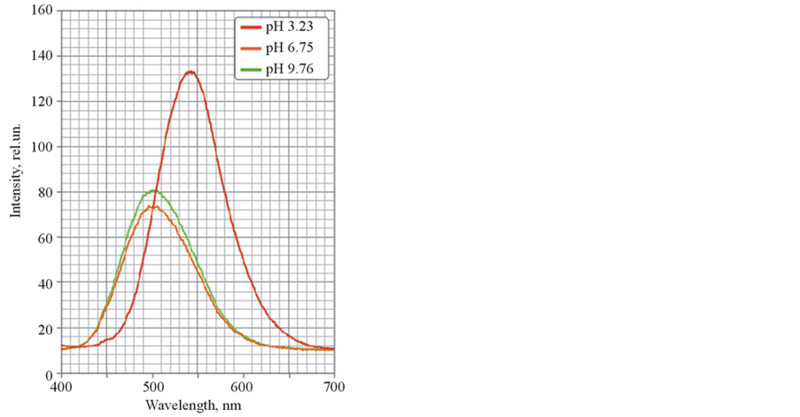 Absorption spectra of the hybrid nanostructures at different pH. of the hybrid nanostructures. Test solutions of cyanoacrylic acid I in presence of N,N’-Bis-(3-diethylaminopropyl)malonamide were investigated. No significant influence of separated malonate onto spectral properties of fluorophore was given. Therefore, just molecules C60 affect spectral properties of cyanoacrylic acid I in the hybrid nanostructures. Figure 6. 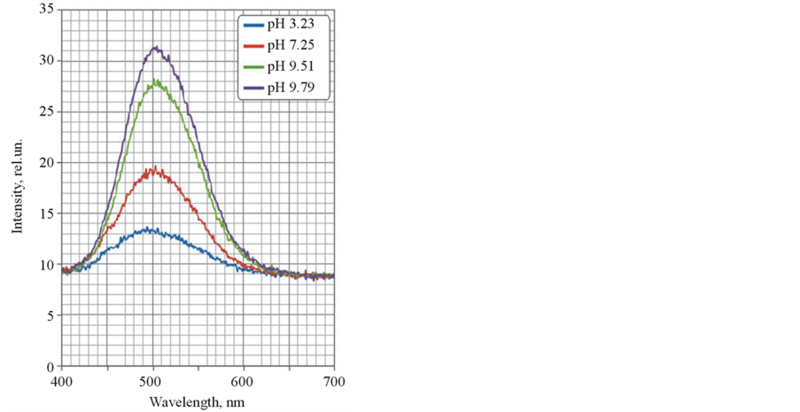 Luminescence spectra of the hybrid nanostructures at different pH. Figure 7. 1—Water solution of cyanoacrylic acid I (рН 9.76); 2— Water suspension of cyanoacrylic acid I (рН 3.23); 3—Water solution of the hybrid nanostructures including modified C60 and cyanoacrylic acid I (рН 3.23). explained by a formation of charge-transfer complexes between С60 and cyanoacrylic acid I. It was proved by fluorescence spectroscopy observing no luminescence maximum shift in the hybrid nanostructures whereas the shift was observed for separated cyanoacrylic acid I without modified C60 (Figure 4). Hybrid nanostructures including modified fullerene C60 and carbazole derivative fluorophore were investigated in this work. A luminescence quenching of fluorophore was observed in the hybrid nanostructures due to Ferster energy transfer. A change of luminescence features (wavelength and magnitude) was observed due to a formation of charge-transfer complexes between fluorophore and C60 molecules. This work is supported by Russian Foundation for Basic Research, grant No.14-03-00479 А.
Klimov, V. (2012) Nanoplasmonics: Fundamentals and Applications. Pan Stanford Publishing, Singapore.